There’s something special about being a writer and spending time with other writers. For me, that is hands down the biggest appeal for attending the RWA National Conference. This job that has chosen a lot of us is not an easy endeavour; it tends to isolate its practitioners. By the very nature of the work, we’re set apart from our friends and family who have “real jobs”. The only time we feel understood and appreciated, the only time we feel justified, is when we’re with other writers. This trip afforded me the chance to spend time with the lovely and talented Ms. Lara Santiago. We hit it off the first time we met, last year in Houston. This was our fourth opportunity to spend time together, and I feel blessed and highly favoured that Lara gave me so much of her time. 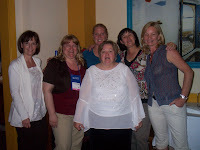 I also had the occasion to meet new Siren authors Allie K. Adams, Wendi Darlin and Jami Davenport. A special treat for us all, and completely serendipitous, new BookStrand author Francesca Prescott, was visiting San Francisco with her family from their home in Switzerland. If you’re looking for new authors to discover, I humbly urge you to give their work a try. San Francisco was beautiful, if chillier than I anticipated. That’s literally, not figuratively. I’d gotten a heads up on the temperature before departure, and so had a jacket with me. I did get out of the hotel some, and got to see Fisherman’s Wharf, and Pier 39. I glimpsed Alcatraz and the Golden Gate Bridge. Our taxi driver took us back from the Wharf one night along Jones Street. I have driven through the mountains of Pennsylvania, but have never been up such a steep incline...or down one, for that matter in all my life. The angle is so sharp the sidewalk has stairs in it. Thank goodness this city doesn’t get snow. 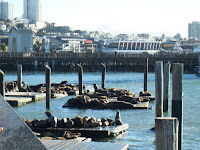 A delightful surprise to me were the sea lions sprawled about on wooden platforms. They jostled for space, made a lot of noise, pushed each other out of the way and into the water and then yapped off some more. I couldn’t help but laugh at their antics. It was inspiring for me to be in the same space and breathing the same air as such wonderful authors as Nora Roberts, Vicki Lewis Thompson, Jayne Ann Krentz, and—this lady’s presence another delightful surprise—Linda Howard. I enjoyed going to the seminars, because I’m personally of the opinion that I still have a lot to learn. You may or may not know that I walk with the help of a cane. I have osteoarthritis in my ankles, and while it’s better than it was thanks to the swimming I do, walking is still very painful for me. But you don’t let something as transitory as pain stop you from doing the things you really want to do—at least I don’t. So it didn’t matter to me, really, how many times I had to trek the corridors of the enormous Marriott hotel. I got where I needed to go and listened to the speakers I needed to hear. I took notes and I took pictures. Now if you’ll recall last week’s essay, my husband and I were at cross purposes: he was praying like mad for an earthquake; I was praying like mad for none. I won. Seismic episodes aside, my beloved enjoyed his vacation. He went on a tour of Alcatraz and Angel Islands, and spent time down at Fisherman’s Wharf. He especially enjoyed his tour of the Liberty Ship that is anchored there. Though it was only four days, he felt that he saw everything he’d really wanted to see. Now I’m back home, refreshed and refuelled and doing what I love best in the entire world. How cool is that?